Hello, my name is John and I am an amateur writer. I've actually been trying to make a habit of writing for years now but only in the past two have I actually made any progress in that respect. As I've delved deeper into the world of writing and slowly, very slowly, developed a daily writing practice I've begun to think more on ways to improve my writing. Although it might seem like an obvious first step I realized that I don't read nearly enough, especially given that my writing pursuit of choice is fiction. I noted in a journal entry a while back that I should make a more concerted effort to correct such an egregious mistake on my part. As I penned in the entry my mind began to wander as I wondered where to begin. A year previous I had rediscovered my love for the library but I always seemed to come home with more non-fiction than anything else. I also wasn't too confident in my ability to resist that temptation as time went on, or where to start in the first place with such a large selection at my disposal so I began to consider alternatives. One of my wife's cluttered bookshelves. Then a moment of insight struck me. My wife has been an avid reader for years. In some respects she might make a better writer than myself since she already has such a strong foundation in reading. As a result we have bookshelves, plural, full of books that I've never read, or ever really considered reading since I tend to be rather particular about my fiction. The opportunity was there, though, and it wouldn't even cost me a dime. For that matter I had a number of unread books of my own just biding their time on my corner of the shelves. A crazy idea occurred to me, what if I dedicated myself to reading every work of fiction in our house? 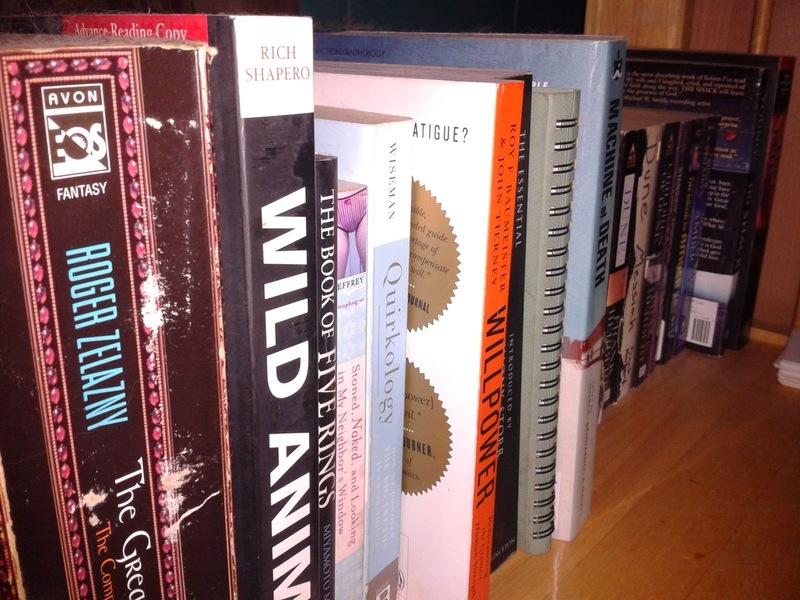 I've always held an unspoken ideal that if you display books in your house you should have at least read most of them. So I got up and started counting to get an idea of what I'd gotten myself into. I mulled it over for about an hour or so before finally deciding; 'You know what, why not? Let's do this'. Maybe not everything will be up my alley but it's important to take in material of all sorts and try new things. So, here I am. I figured if I'm going to try and tackle 175+ books maybe keeping a blog on it will help keep me focused. So, join me on my odyssey back into the world of fiction. If I happen to gather a following of sorts maybe I will pose some future book options for my readers to decide upon. For those interested my wife's book collection it contains a LOT of fantasy including works by Patricia Briggs, R.A. Salvatore, and Anne McCaffrey as well as a small amount of sci-fi and comedy. 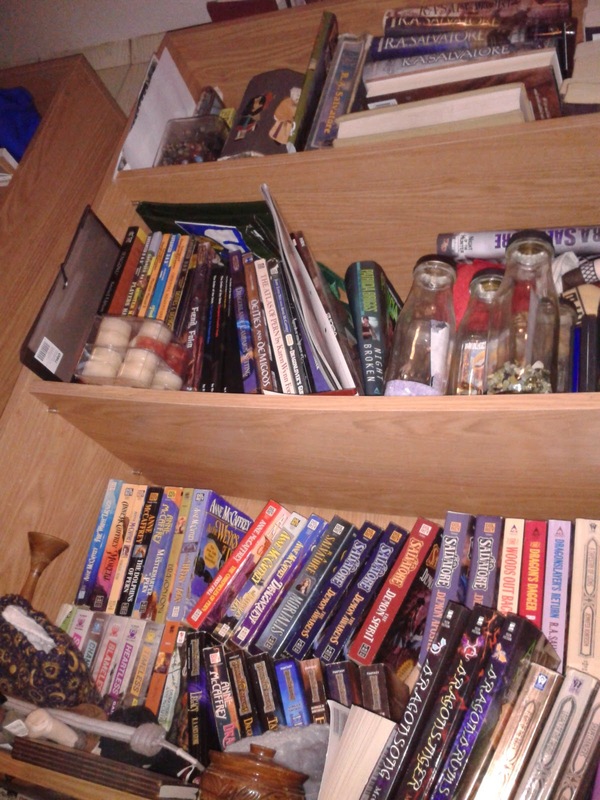 As for myself I have a little bit of everything including some old books from Best-sellers lists and including authors such as Terry Pratchet, Roger Zelazney, Steven King, and whoever the author of the Dune series is.